Interviewers are more afraid of you than you are of them. The average interviewer has the same level of performance anxiety as you. They’re afraid they might ask illegal questions, not gather the information they need to make a wise decision, scare away their preferred candidate, or hire the wrong person. The candidate who helps to put the interviewer at ease, smiles, engages in small talk, and comes to the interview well prepared. Interviewers are often trained to help build a rapport and put the interviewee at ease. If you return the favor, this will not go unnoticed. View the interview as your first day on the job. 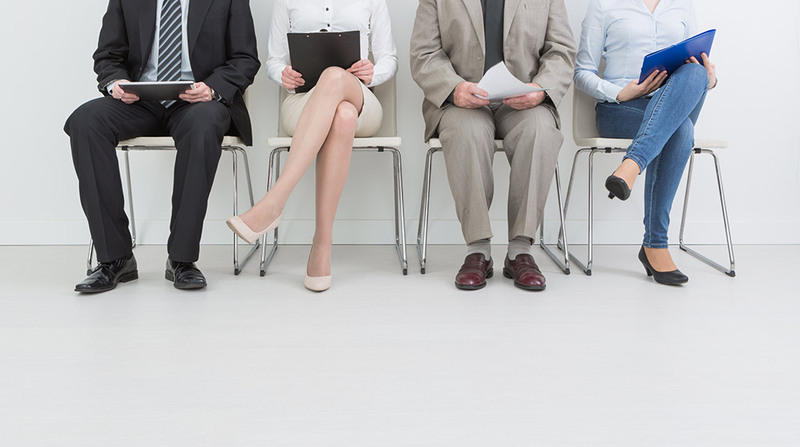 Interviews are stressful and can lead you to feel awkward and nervous, but employees who are excited and engaged in their new position will be personable, enthusiastic, and genuine. Do your best to swallow your nerves and be the person that you would be excited to have as a new colleague. Smile before, during, and after the interview. The act of smiling releases endorphins in your body, which makes you feel better. When you smile, your body infuses itself with something stronger than morphine. The physical act of smiling makes you feel better. Use this to your advantage. Smiling before the interview helps you to relax. Smiling after the interview helps you to relax. Smiling DURING the interview helps to relax BOTH you AND the interviewer! You’ll come across more confident and the interviewer will view you more favorably as a personable individual welcome to any team. Stay out of the “woulds”. Past behavior is the best predictor of future behavior. Answer every question about your work experience in terms of your actual EXPERIENCE. Your actual behaviors. Your actual ACTIONS. Interviewers don’t want to hear what you would do, they want to know what you HAVE done. Past experience trumps good intentions. Walk the interviewer through, step-by-step, what you said, what you did, and what was the outcome of your actions?” Stay out of the “woulds”. Stay in the past tense. This is the heart of the current trend in interviewing called BEHAVIORAL INTERVIEWING. Past behavior predicts future behavior. STAR stands for: Situation or Task. Action you took in that situation. Result of that action. Simple. Tell the story of what was going on, what you did, and what was the outcome. 1, 2, 3. Remember that the heart of the STAR is the Action. What specifically did you do to bring about the positive result? Don’t focus on what your team or department did, instead, focus on what YOU did in that particular moment in time that resulted in the happy ending. Come to the interview with a couple dozen really good past tense examples of how you’ve handled various situations in your employment history and I’ll likely be quite impressed. Do NOT be yourself… Instead, be your own spokesperson. If you’re behaving completely as yourself, how modest in that conversation will you likely be when talking about yourself? If you’re anything like 98.7% of the population of the U.S., you’ll be quite modest, reluctant to “toot your own horn”. If you’re simply “yourself”, you’re very likely to undersell yourself in a buyer’s market. So don’t be yourself in the interview. Instead, be your very own spokesperson with a third-person perspective on why you would be a valuable addition to their team based upon past positive results. Don’t be cocky, but do be confident. Don’t dress for success. Dress for the interviewer. Dress to impress and complement an individual. When you think of what to wear for an interview, here is a simple and universal rules to remember: How you dress speaks volumes to the interviewer as to how YOU view the interview. Are you taking it seriously? Are you trying to make a good impression? Can the interviewer picture you in the position for which you’re striving? Showing up in a t-shirt and jeans for a director level position does not reflect that you are someone who is conscientious of the impression you’re making in this meeting. Don’t know the competition? Doesn’t matter. Know the company. The competition will not be in the room during your individual interview. There are no hecklers in the back of the room berating your responses to the interviewer’s questions. The interviewer doesn’t care that you do or do not know who else is interviewing. What they DO care about is what you do or don’t know about the company, the department, and the position for which you’re interviewing. Do your research. All interviews are bi-lingual conversations. Your words only make of 7% of what you are saying. The remaining 93% is 55% is body language and 38% is tone of voice. Be sure that when interviewing you don’t ONLY focus on the words you use. Your body language and tone needs to support and resonate with the words coming from your mouth. What do you mean they didn’t know I wanted the job?! Don’t assume the interviewer knows that you are excited and truly interested in the job just because you are at the interview. Verbally state during the interview that you want the job. And then follow up with a THANK YOU CARD again stating in clear language that you’re excited about this opportunity and look forward to hearing back from them. A few strokes of the pen and a stamp can make all the difference, believe it or not.